It supports multiple languages and allows several configurations to cater to your needs. It has REST API and code hooks. Resident Plugin can be used in place where we are managing residents like Vacation homes, Apartment Leasing Companies, Senior Living Homes etc. Unpack the zip file to the plugins folder of Redmine. It also requires db migration. For rufus-scheduler to work , the rails application should be up all the time. folder upon server startup, so please make sure public/plugin_asset/redmine_wktime has proper access. - Changed SVG charts to 'Chart.js'. - Total for Payroll list page. - AR report does not have currency sign. - Without Purchase Order not able to create Supplier Invoice. - Submit button for time sheets doesn't show up. - A new leave couldn't be configured from the plugin config page. - Asset module is introduced. - Inventory module is introduced. - Purchasing module is introduced. - Lock Time and Expense sheet. - basic, allowance and deduction total row missing in payroll report and user settings page. - Payslip show incorrect financial period. - Show Incorrect total in Accounting. - Payment added to Billing Module. - Contacts can be billed. - Exchange rate is introduced. - Issue based billing introduced. - CRM module is introduced. - Moved Accounts to CRM Module. - Fixed: Uncaught TypeError is causing "Loading..." not dismissed . - Accounting module is introduced. - Could not Clock in/out when redmine installed in sub uri. - Couldn't save Account on mac safari. The plugin name has been renamed from Time & Expense to ERPmine. The Billing module is added to the plugin. 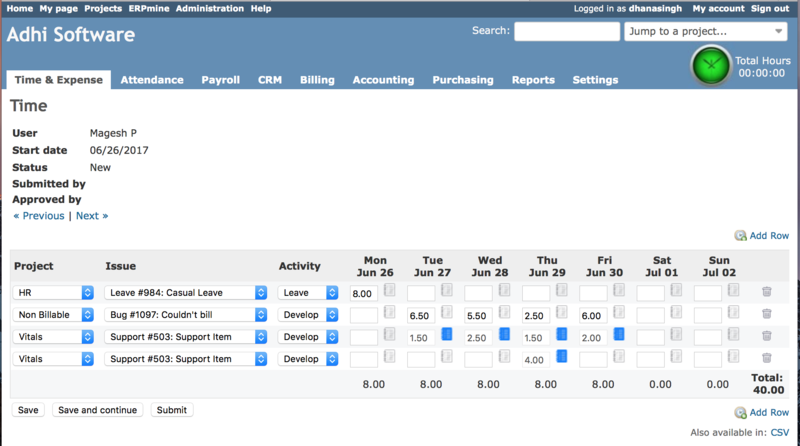 - Payroll module is introduced. - Merged Time and Expense modules under new 'Time & Expense' Tab. File Based Integration with Attendance / Time Clock Device. clock in/out list and edit pages are avialable from Attendance module. Manually re-run the period end process for attendance module. Fixed the total hours for month column total in Attendance report. Fixed Date range calendar popup problem in Time & Attendance module. fixed the sqlite query problem on the T&E list page. - Made compatible with Redmine 3.3.0. - Time & Expense report is available from Report module. - Show the first clock in and last clock out time of the day. - Show the List page for users with view permission also. - Added permission logic for viewing expenses report. - Fixed the clock in/out column shift error. - Fixed the leave total hours bug in attendance list. - Left align the report header. - Clock-in and clock-out widget on the banner. - Pagination in the report popup. - Allow TE Admin to Delete entry in attendance. - Show / Hide Expense, Attendance and Reports modules. - Configuration for Min/Max hours per week. - Configuration of user group for non submission mails. - Fixed the language Problem on issue Id Validation Message. - Log Time : Approved/submitted sheet don't allow time entry through edit issue screen. - Show 'No record to display' if there is no record in attendance report. - validation for Min Hours is less then Max Hours. - Expense total does not show correctly in Deleted Projects. - ast day of the month not shown in the attendance report. - Does not save expense amount greater then 100000. We would like to thank LYRA Networks ( https://www.lyra-network.com/en/. ) for partially sponsoring this release. - Made compatible with Redmine 3.2.1. - User filter introduced in Attendance tab. - Previous and Next link added in attendance detail page. - Group filter introduced in Reports tab. - Fixed decimals not taken into account when registering expenses. The plugin name is renamed to Time & Attendance. - Made compatible with Redmine 3.2.0. - Attendance module is introduced. - German translation is included. - Fixed SQL Server issue. - Fixed time entering format issue. - Fixed issue forbidden error on "Enter issue as ID/Subject". - Made compatible with Redmine 3.1.1. - Reminder email for submission and approval can be send by manager and TE admins. - TE admins are allowed to modify and approve time/expense. - Added User custom field filters in list page. - "Please select" option is added in Issue and Activity dropdown. - In log time page, error message is shown for restricted tracker type and on TE related error, the Create/Save button will be disabled. - A warning message is shown when the user leaves an unsaved time/expense sheet page. - Permission changes - When a Manager edits a Member T&E, his permission will be checked rather than the member's permission. We would like to thank Fotonation ( http://www.fotonation.com/ ) for sponsoring this release. - Sorting of timesheet rows. - Allow entering time in different format. - A new non empty icon is introduced for empty detail time entry popup. - Comment box size is increased. - Name is shown for closed or inactive project, issue and activity. - Error message is shown if issue is blank when "Allow blank issue" is OFF. - Closed date is considered instead of updated date for closed issues. - Filters will be remembered in list page. - Made the plugin compatible with Redmine 3.0.1. - Implemented 'Save and Continue' button on the edit page. - "wktime/getstatus" loading over HTTP on site served over HTTPS. - Users can delete submitted & approved timesheets. - Email notification not sent due to upper case in file name. - The user with 'Log spent time' or 'View spent time' permissions will be able to see the Time & Expense list page. - The user with 'Edit time logs' permission is allowed to manage other member time/expense sheet. - User with View Spent time permission can only see the list page. Starting from version 1.5, it requires the gem rufus-scheduler. - Issues selection is enhanced by its subject autocompletion. - The timesheet can be filtered by projects and then by users. - code for summing hours of same entry has been removed. Fixed the bug - "Comments are not visible for the last row of timesheet"
Thanks to the following people for their feedback and feature requests. Thanks ro Alfredo Bonilla, J P and Alexander Schramm for feedback and enhancement requests. Thanks to Igor Zubchenok, Alfredo Bonilla, Rafael Fresno for their feedback and enhancement requests. This is really cool plugin. Unfortunately 3.3 don't work with Redmine 3.4.4. In this case you can use ERP-mine version 3.1. The plugin is great. We use it for daily activities in our company. However when we updated it with the latest version 3.2.1, it crashes on Time & Attendences tab. Shipment is only inward, i.e. stock receipt, correct? Please add "Delivery" functionality too, same as Shipment, but when it goes from stock (Location) to Supplier/Contact. Good plugin, but the new lacks integration with the basic Redmine. (can't assosiate leads, accounts, opportunities, etc to proyects). It is an excellent plugin, especially considering it is free. I had an issue with one of the features, and the creators were very helpful. Very Good Plugin. Works fine and support is very good too. Nice & Simple time tracking for small organizations. I have used worklog utility in my team, which is less than 10 persons. After everyone is requested to deliver worklog, our work progress is dramatically improved. Great plugin... is there a way to add "comment" to the PDF export ? Best plugin so far to do weekly timesheets. Very useful. It save so much time and help to enter very quickly your time.